We arrived kind of late for the lunch crowd and just ahead of a really heavy rain shower. This is actually the Atlanta outpost of Texas-style BBQ joint from Compton. 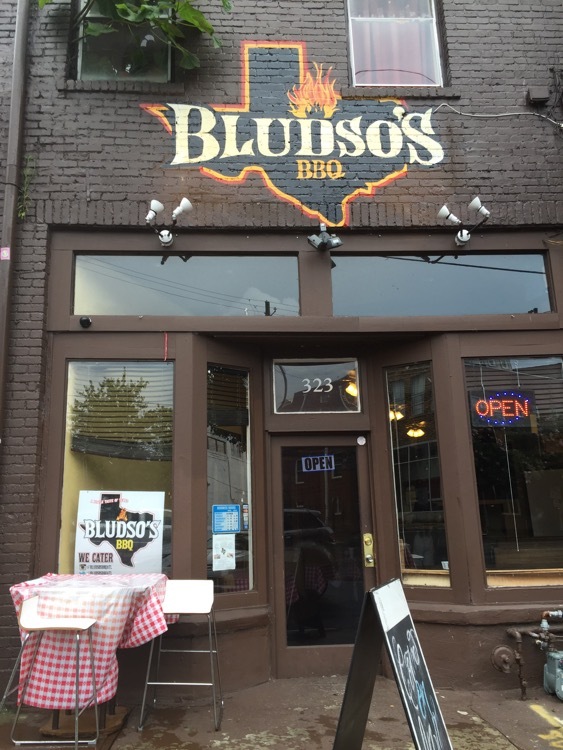 Yep – Texas barbecue, in the ATL, via LA. According to their website, the primary focus is catering and carry-out, but they do have seating for 30-40 people between the two levels. Even though there were only two parties (totaling 3 people) in line in front of us, it took a while to get our order placed, which didn’t portend well. 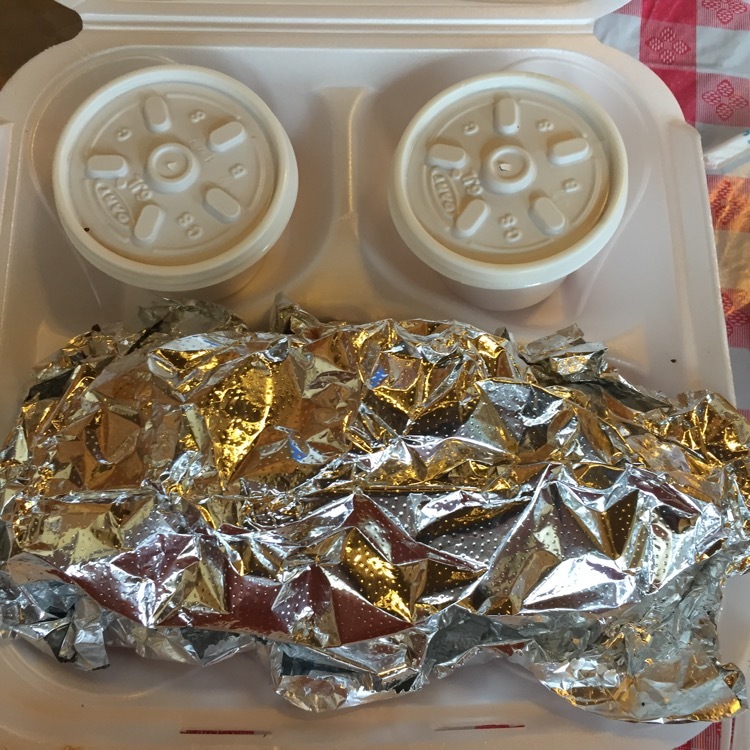 We didn’t look at the menu on-line, but my beloved was planning on having some chicken with a salad or a baked potato, but we were surprised to find that neither salad nor baked potatoes were on the menu. (She told me to go ahead and get a plate and she’d get something later on.) Also, for what it’s worth, they don’t have iced tea, other than in a can. 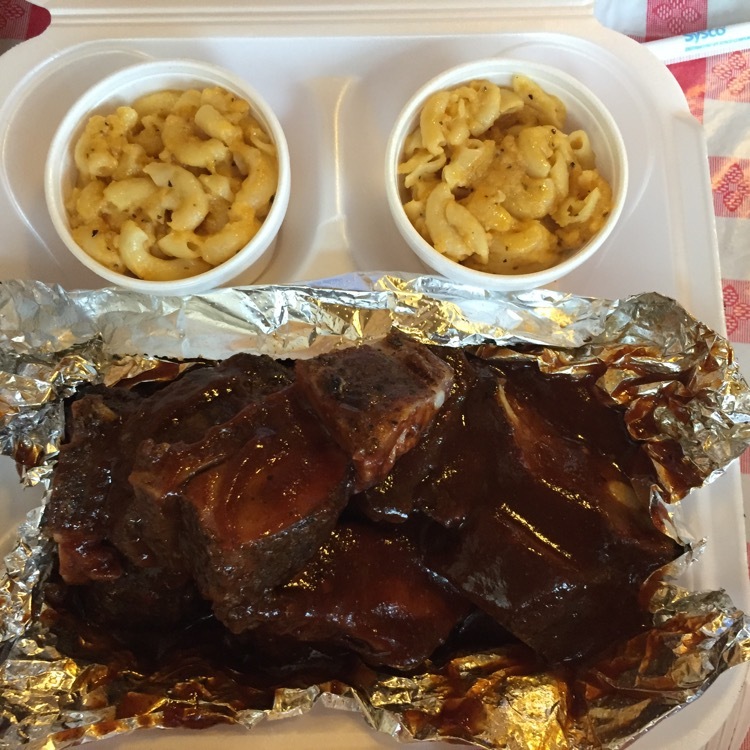 The menu did have a wide variety of meats – beef rib, beef brisket, rib tips, chicken, chicken links, beef links and pork shoulder – and a quintet of sides – cole slaw, baked beans, mac-n-cheese, greens and potato salad. They didn’t ask whether I was eating in or out, but since I was only ordering one meal (and there were two of us), they served me “to go”. Wonder what this is? I chose a two meat combo (brisket – they’re Texas-style barbecue, this should be their specialty, right? – and rib tips), with double mac n cheese. You can’t really see the brisket in this packaging, but it is underneath the rib tips. The meat was slathered in sauce – in retrospect, I should have ordered it “dry”, because the sauce was a little sweet for me. The mac-n-cheese was fine, with a little bit of smoke. The rib tips were large and meaty and the brisket was excellent. When I dug a fork full of the brisket (which absolutely shredded when I tried to pick it up) out from underneath the sauce, the smoke flavor was apparent and the meat was moist. And it wasn’t only me who thought that the brisket was good. As we were leaving, I stepped toward the kitchen to ask about the smoker and the woods they used (a custom built rotisserie style smoker, cooking over pecan and hickory, cooking the brisket for about eighteen hours). As I was talking with the pit master, who said he comes in at 3:30 to get things going, Jo stepped up behind me and said, “He makes me eat a lot of barbecue. And that was good brisket!” That’s quite an endorsement! Do yourself a favor – go there and order brisket, with the sauce on the side. I think you’ll thank me. Unless of course, it’s East Texas BBQ, which has a lot of soul in it. 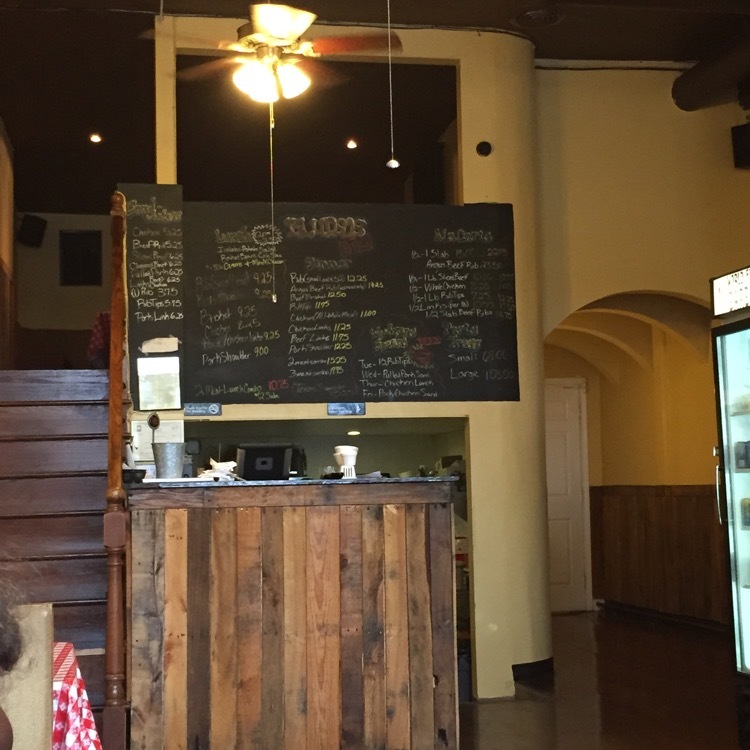 Ok, I see a painting of the shape of Texas on the front door, but they serve their brisket with sauce on it?? Get a rope!! Every good Texan knows that good brisket doesn’t need sauce!